The Impenetrable Walrus/Student Bolshevics (or Bolsheviks, depending on who was writing it) were an Art Gang formed in the BFA program at University of Manitoba in the mid-80s. 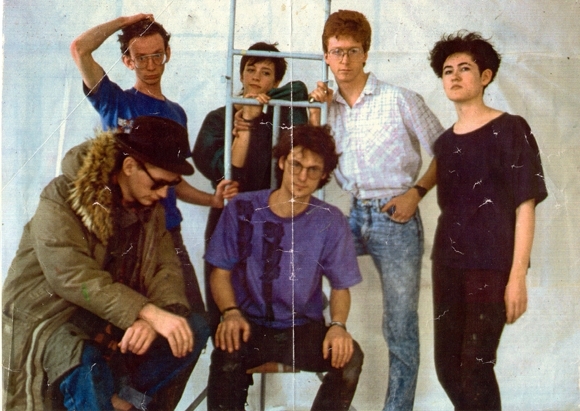 Although characterized by a shifting and inclusive membership (and self-named sub-collectives Art Guys and Art Sluts) there was an initial core group consisting of the yonder pictured individuals plus Veronica Lajambe, who were together featured in a S/T group show at a professional parallel gallery while still students. The IW also got involved in student government, taking over the Fine Arts Student Council, engaging in intramural sporting activities, sponsoring musical performances, and publishing LESS ART zine, Artist Romance Comics, DIY exhibition catalogs, and assorted other outreach projects. By far the most impactful of these was the diversion of Fine Arts Student Council funds to subsidize a series of off-campus exhibitions at a pop-up space known initially as "Un-Art" but which would soon morph into the "Student Bolshevick Gallery." At more or less the same time the expanding circle of IW associates rebranded itself by the same moniker, except for the Gallery part. Included under the umbrella of Student Bolshevism were the formative public performances, radio experiments, and cassette culture activities of improvisational audio collage group Mannlicher Carcano -- as well as a variety of solo projects by DougH, John Higham, M.A. Peers, Mike Waterman, and others -- all of which were considered triumphs of the Bolshevick agenda, unintelligible as it was and remains. The Impenetrable Walrus/Student Bolshevics era started crumbling as members began leaving for grad school - first John Higham to Yale, then Veronica Lajambe to CalArts, DougH & MA to UCLA -- none of whom has, at press time, returned to Winnipeg except to visit. The Bolshevick brand carried on for another year or two of exhibitions, then as the boiled-down studio/showroom of core members John White and Michael Jacobson, until gentrification forced them to close their last Chinatown digs. A underdocumented and more anarchistic precursor to subsequent higher profile Art Gangs, the Impenetrable Walrus/Student Bolshevics era is also a mystery spot in Winnipeg and Canadian art history -- an explosion of clever, funny, beautiful, experimental DIY multimedia artworks (not the least being the social sculpture that was the Student Bolshevics itself) that was both inclusive and elitist -- only Real Artists™ need apply! ...and many more; e me if you were in a Bovlshevick show and want your name added! Mall Art Tour (parades and displays through various Winnipeg malls) -- John Higham was the mastermind of these.